Don Jazzy Signs Iyanya To Mavin Records? There was pandemonium on Wednesday at the Costain area of Lagos State as an official of the Lagos State Management Authority and a bus driver were reportedly beaten to a pulp. PUNCH Metro learnt that officials of LASTMA had allegedly apprehended the bus driver at the Costain bus stop, for allegedly violating a traffic rule. It was alleged that an argument ensued between the driver, his conductor and the officials. In the ensuing scuffle, a LASTMA official allegedly punched the driver and he slumped. A mob was reported to have barricaded the road in protest as the driver lay on the floor, foaming in the mouth. 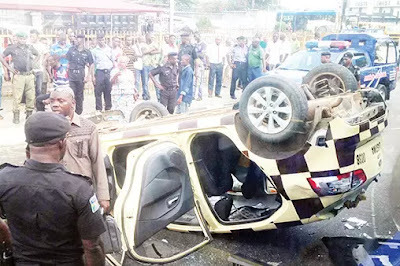 The mob reportedly vandalised a LASTMA patrol car which drove into the protesters at the time, beating up the officials. They were said to have mobilised and also attacked the LASTMA office in the area and vandalised vehicles in the yard before the intervention of policemen from the Iponri division. A witness, Ibrahim Adisa, said the incident happened around 9am. He said, “We saw that the LASTMA officials held the bus driver at the junction for breaking traffic rule. The man did not release the vehicle to them, which started an argument. The driver and the conductor then started fighting the LASTMA men. “One of the LASTMA officials put his hand in the pocket and brought out a ring which he used to hit the driver. The man fell and started foaming in the mouth. The officials then took his bus into their yard and left him on the ground. PUNCH Metro learnt that the driver was later taken to a hospital after the police arrived to quell the unrest. A motorcycle rider said the situation would have been worse but for the intervention of the police. “Traffic was at a standstill and the hoodlums were looking for LASTMA officials or any government official to attack,” he added. As of 3pm when our correspondent left the area, no traffic official was in sight as police patrol vehicles mounted surveillance in the area. The Police Public Relations Officer, SP Dolapo Badmos, confirmed the incident, adding investigations were ongoing. The spokesperson for LASTMA, Mr. Mahmud Hassan, in a statement, denied that the driver was beaten by an official of the agency. He explained that some hoodlums, who were attempting to free the driver’s bus, invaded the premises of the agency and vandalised vehicles. He said, “The commercial bus was apprehended for illegal picking and dropping of passengers in the Costain area. The commercial bus was subsequently taken to the nearest yard of the agency at Iponri for booking. “However, in a bid to circumvent the law and retrieve the vehicle from LASTMA’s yard, the driver mobilised friends and hoodlums, who attacked the Iponri office of the agency. They injured our personnel and damaged vehicles in the yard. However, when the driver’s action did not yield the desired result, he stripped himself naked and created a scene in order to draw the sympathy of unwary members of the public. Hassan said two of the hoodlums had been arrested and would be arraigned in court. The General Manager of LASTMA, Mr. Bashir Braimah, according to the statement, said no amount of violence would make the agency to shy away from its statutory responsibility.